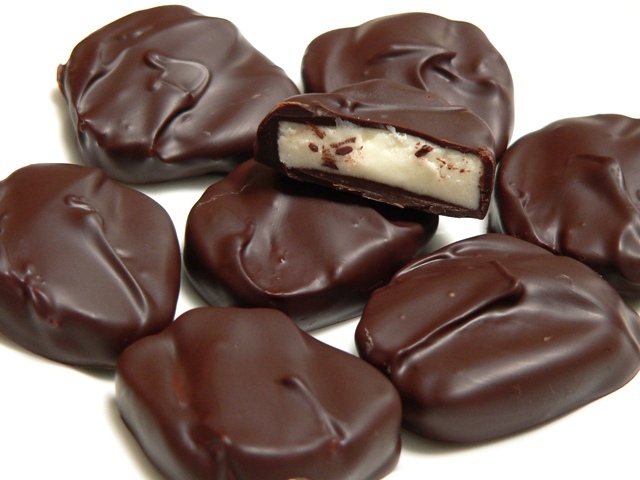 I altered the original recipe slightly to simplify the handling of the peppermint cream and dipped the centres in tempered chocolate rather than the chocolate and shortening mixture specified. The original recipe is here, if you’d like to cross-refer to it. 1. In a stand mixer, combine the sifted icing sugar mixture, butter, extracts, heavy cream and mix on low speed until combined, then beat at medium until the mixture is well blended and creamy. 2. 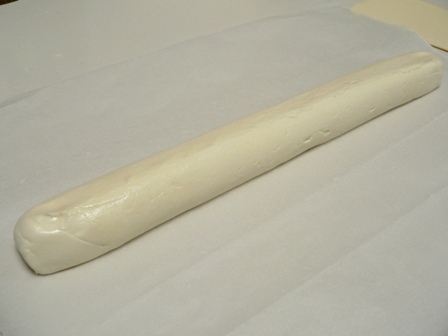 Shape the mix into a long thin log (mine was about 2.5cm/1″ thick) and wrap in parchment paper, twisting the ends to seal. Chill in the fridge for about an hour. 3. Unwrap the log and slice it into thin discs. Lay these out on a tray lined with parchment paper and return them to the fridge while you temper your dipping chocolate according to the instructions here. 4. Dip the peppermint centres in the chocolate and allow them to set on a tray lined with parchment paper. Store the finished chocolates in the fridge and try not to scoff them all at once! I used up all my mint extract on the first batch of chocolates, and rather than buy more, I thought it might be nice to try and make some at home. Let me know how this goes…I’m looking forward to having my mint grow back once winter is done and dusted. Love these…I need to learn how to temper chocolate! These look fantastic Celia. I am with Pete on the inedible commercial ones, but I do sometimes like the Mint Slice biscuits – mainly because it is dark chocolate with the mint. I don’t know what filling they use in the commercial ones – something odd and pastey. Clag? Your version sounds lovely with real cream. And I am impressed with the home made mint extract. I will be interested to hear how it goes as well. By the way, my vanilla extract that I made about four and a half months ago after you wrote a post on it is brewing nicely but still has a definite alcohol taste – does this go away eventually or have I just not put in enough vanilla beans? Hey Celia, Great post! Do you think I can make the mint cream filling with a hand mixer?? I’d love any suggestions you have on playing with the basic fondant recipe – I was thinking it might even make a pipeable filling for the inside of moulded chocolates? What do you think? I’ve made mint fondant and piped it into chocolate before and it works really well. But it was very soft. I bought a tub of findant too but what I would like is a firmer consistency … just like the roll you have in the photo … slice/use mini cookie cutters and dip. I must post how I made the fondant … maybe I just didn’t work it enough. It was hard work! My vanilla extract bottle is always full, Brian keeps topping it up whenever I use a bit. It’s been brilliant. Much nicer than shop bought stuff. This looks great — I’m going to try it in the shop. For the softness of the fondant, it might be better to spread it out flat, and then put a “foot” on it by spreading a thin layer of tempered chocolate over it, and then cutting it into pieces. Then put the chocolate side on the fork to dip it, and the fork won’t go through the soft fondant. That’s what we do with the chocolate ganache when we dip truffles. 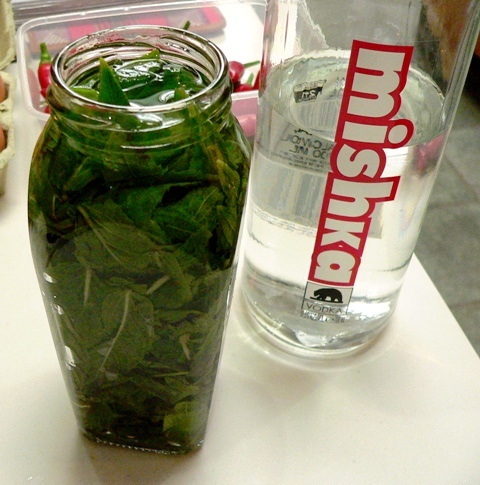 Homemade mint extract. You are my new hero. I’m going to have a go at these when I get back to Brisbane. I’ll have to make them when I have people coming over or I know I will gobble the lot.